Lego Matrix of Dots printer – snappy title, eh? 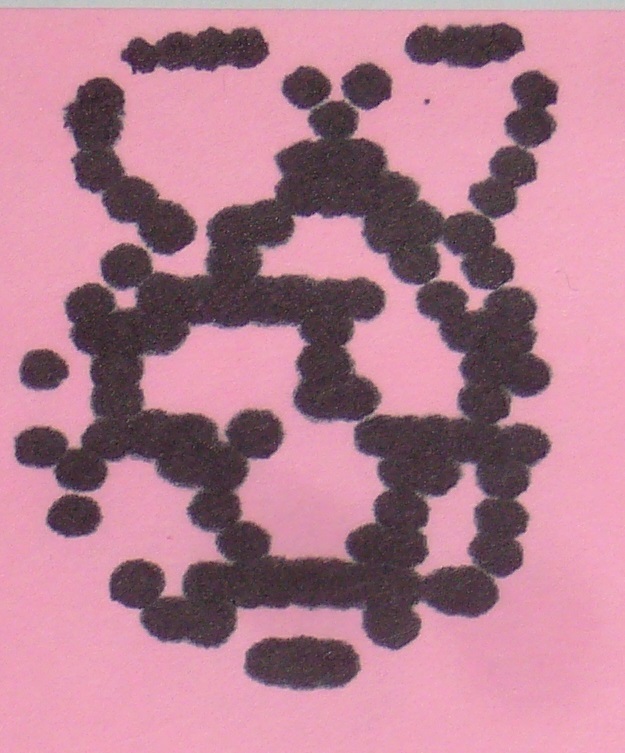 Here’s the Egg Drawing robot converted into a simple one-dot dot matrix printer. I’ve borrowed a routine that I used in the Minecraft Relief Maps project and used that to interpret a JPEG file. There are methods which use Pygame, but I’ve stuck with things I know – and can achieve quickly. The program reads in the image and converts it into a pattern of “#” symbols and spaces using JP2A. For this reason, a decent monochrome image makes a good starting point. Once converted, it’s split into lines and the servos are then made to scan backwards and forwards, putting in a dot wherever JP2A has left a “#”. I needed to convert between coordinates on the bitmap and the actual positions needed by the servo. This is relatively easy to do once the correct range given by the servos has been found experimentally. I had a few problems with the pen bouncing, and also the route that the pen takes is really a curve. This would be more suited to drawing bitmaps on eggs, so that’s the next step. Maybe “Egg Minions?”. line = commands.getoutput( cmd ) # send cmd as a command to the operating system and receive the result. print "Your picture has been converted to"
for letter in row: # work along each row - check each character. Once that’s all running, assuming you have a MonoLogo.jpg file available, the machine will convert and start automatically. 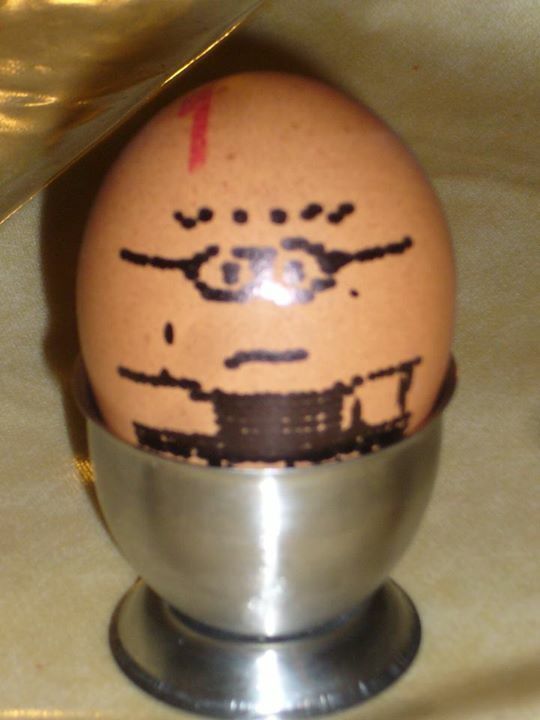 The finished egg – just in time for breakfast. The program to draw a grid of squares on the egg. 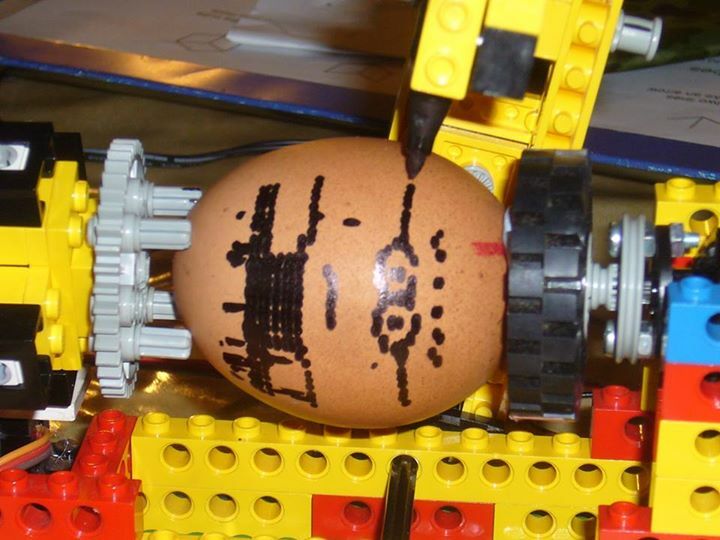 In order to program the egg drawing robot, a simple pair of loops are required. One draws the horizontal lines and the other is responsible for the vertical ones. Overall, the grid is fairly simple but it’s ideal for demonstrating control over movements, the resolution of the servos and the pen and just showing what can be done with some Lego and some servos. Next up… hopefully bitmap conversion! This looks like another rather interesting programming challenge. A PiFace could drive a couple of stepper motors quite easily. It would then be (hopefully) a straightforward job to convert X-Y Cartesian Coordinates into stepper motor positions.